It's over the top, bold, bright, borderline ridiculous but always, always fabulous: of course its Lacroix. 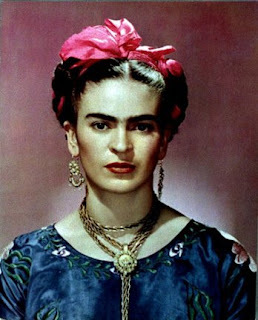 The first thing I thought of when I saw this was Frida Kahlo. I love Frida, so this is a very good start. I love everything about this. From the crazy acid green fur, to the Masai-type beads that are hanging loosely from the jacket. And those degradé stockings? F-A-B! The mix of prints here is fantastic, and I love how this is sort of a casual t-shirt and skirt look gone madfully (i just made up a word!) luxe. Breathtaking. Really. I know everytime I see a grand ole' dress I say that I want to get married in it, but those where all lies. This is what I want to get married in, and if I never get married then, this is what I want to wear to some incredibly fancy party I will throw where I will get to wear the most beautiful dress in the entire world and that dress is this one. Oh, it's just too much. PS. My apologies for not posting yesterday, I was super duper swamped at work!